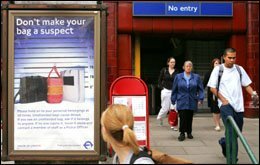 An Asian man was shot dead today by police at a London's Stockwell Tube station, Scotland Yard confirmed. Meanwhile, a statement posted today on an Islamic website in the name of an al Qaida-linked group claimed responsibility for the latest blasts. "We can confirm that just after 10 am armed officers entered Stockwell Tube station. A man was challenged by officers and subsequently shot," Scotland Yard said. Tube services on Victoria and Northern lines have been suspended following a request by the police, London Underground said. British media reported that about 20 police officers, some of them armed, rushed into the station before a man jumped over the barriers with police giving chase. The young Asian man, according to witnesses, was shot five times at close range after he had jumped on a train. The train was standing in the station with its doors open when the Asian man ran on, pursued by three plainclothes officers. There were unconfirmed reports that police believe the suspect was one of the attackers involved in yesterday's incidents. Thursday's attacks in London bore similarities to the July 7 blasts in that they were also implemented by suicide bombers, but in the fresh attacks, the terrorists ran away when the explosives failed to ignite, said the Guardian on Friday. Yesterday, police launched a manhunt for the four bombers behind the failed attempt to cause carnage in the capital. They were scouring CCTV footage from the scene in an attempt to identify the attackers and using the accounts of witnesses - some of whom tried to tackle the bombers as they fled - to build up a picture of what happened. Officers also stepped up their presence on the London transport system as commuters made their way to work by bus, Tube and train this morning. Investigators also searched, on Friday, for fingerprints, DNA and other forensic evidence collected from attacks on three subway trains and a double-decker bus that were hauntingly reminiscent of suicide bombings only two weeks before. What if I was carrying a rucksack? Muslim leaders called on the police to explain why an Asian man was shot dead at Stockwell station this morning, reported the Guardian. The Muslim Council of Britain said Muslims were concerned there was a "shoot-to-kill" policy in operation. A spokesman said Muslims he had spoken to this morning were "jumpy and nervous". Inayat Bunglawala said: "I have just had one phone call saying 'What if I was carrying a rucksack?'. "We are getting phone calls from quite a lot of Muslims who are distressed about what may be a shoot-to-kill policy," said MCB's spokesman. He added that in the current atmosphere, Muslims were very afraid and other people were looking at them in a very suspicious manner." A statement posted today on an Islamic website in the name of an al Qaida-linked group claimed responsibility for the latest blasts. The group, Abu Hafs al Masri Brigade, also claimed responsibility for the July 7 bombings which killed 52 people and four suicide bombers. "Our strikes in the depths of the capital of the British infidels our only a message to other European governments that we will not relent and sit idle before the infidel soldiers will leave the land of the two rivers," said the statement. The "two rivers" in the statement refer to Iraq's Euphrates and Tigris rivers. On Tuesday, another statement was issued in the name of the same group threatening to launch "a bloody war" on the capitals of European countries that do not remove their troops from Iraq within a month.